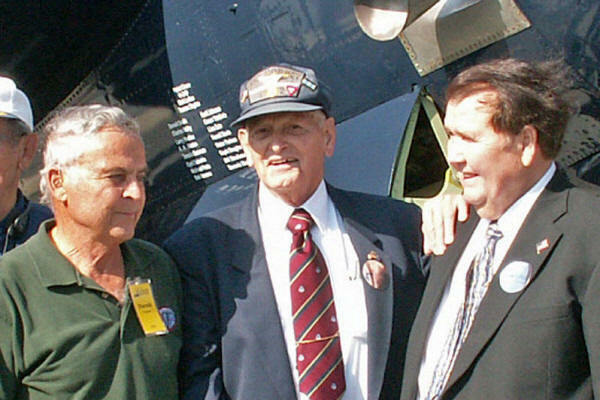 "One of the Midway Air Wing volunteers is Harold [ Hal ] Nemer, a retired Naval Aviator. Hal was a TBM pilot attached to VS-25, a San Diego based Antisubmarine Squadron from 1949 to 1951. His crewman at that time was AT3 Tom Porter. Tom left the Navy to attend college in late 1951. Hal retired in 1970 after 25 years of service. Several years ago Tom tracked Hal down and they renewed their old friendship. During the intervening years Tom had become a pilot and flew his own Cessna Citation Jet. Hal informed Tom that the Midway Air Wing had acquired a TBM-3E to restore and that sponsorship of a Midway aircraft included the privilege of selecting the Squadron markings*. Tom and his lovely wife Peggy immediately sponsored the aircraft and selected VC-25 Squadron markings with Hal's name [ Ens Harold "Nemo" Nemer ] as pilot and Tom's name [ AT3 Tom Porter ] as crewman. Also included was the name of the aircraft donor's father, Sidney Summers, who was a Marine TBM turret gunner during WW II. The photo below was taken on the Midway on Veteran's Day, 10 November 2006, when the Avenger was loaded on the ship. View a gallery of more photos of that event. The exhibition of this aircraft is made possible through the generosity of the Avenger's owner, Mr. Sidney F. Summers. Read how Mr. Summers is memorializing his father with this aircraft. View a gallery of more photos. A sponsor is an individual or group who makes a financial contribution at the appropriate level. Read about sponsorship and SDACM Midway's aircraft paint and marking policy. * After the TBM, the option of selecting aircraft markings will not be available in SDACM's exhibit sponsorship program.